Dan James was the winner of the Annual 2012 Road to the Horse Colt Starting challenge along with fellow Australian horse trainer, Guy Mclean. 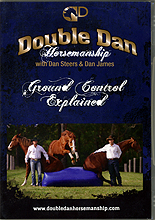 Double Dan Horsemanship was first founded in 2009 when Dan James an Dan and Pia Steers settled in North Arm Cove, NSW. Dan & Dan were now having regular entertainment shows and horsemanship clinic bookings around the country. To date they have performed at every major show and rodeo in Australia and some overseas performances including: Perth royal show, Melbourne Royal show, Adelaide Royal show, Sydney Royal show, NCHA Futurieies, ASH National show, Edinburgh Military Tatoo, National Dressage Championships,Spirit of the Horse, ALEC Openning Ceremony, Equitana Asia Pacific, 2010 World Equestrain Games Kentucky, PBR Newcastle, and 2011 Australias Got Talent!